Our week started with a fantastic sighting of the Vomba Female. 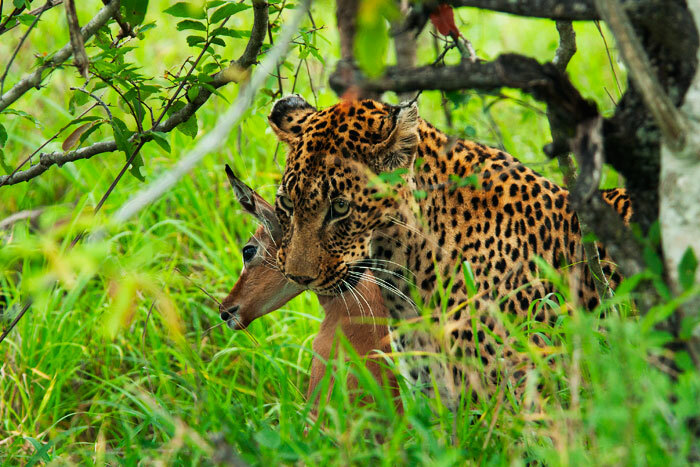 We watched her as she stalked impala through alternating bursts of rain and sunshine. Patience is truly her game and we spent quite a while watching a bush which was concealing her as she waited for the impala to approach. We thought we had lost her when a large male baboon suddenly ran through and chased her into the Sand River. Just when we were about to give up searching for her, we came across an hours-old impala lamb, and were admiring how cute it was when all of the sudden, the Vomba Female reappeared and grabbed it! Luckily she killed it very quickly and, although its life was short, ended without much struggle. We then watched her carry it to a nearby thicket. When she seemed to feel secure enough, she laid down under a jackalberry tree and fed on her prize. 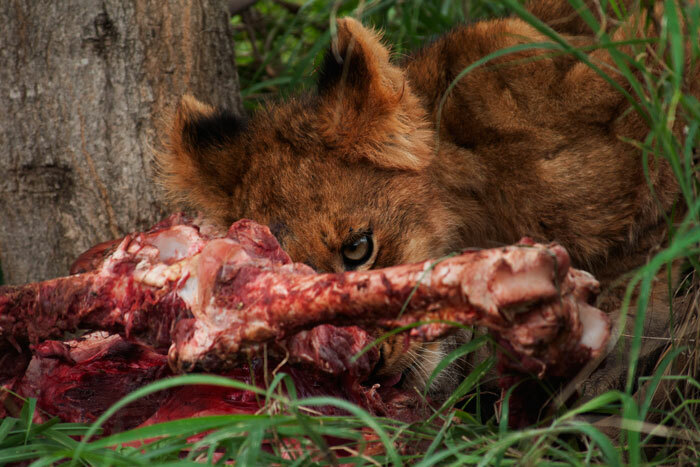 She finished the entire carcass within a few hours and was seen hunting again by the afternoon. Her hunger furthered our suspicions that she might be carrying cubs! 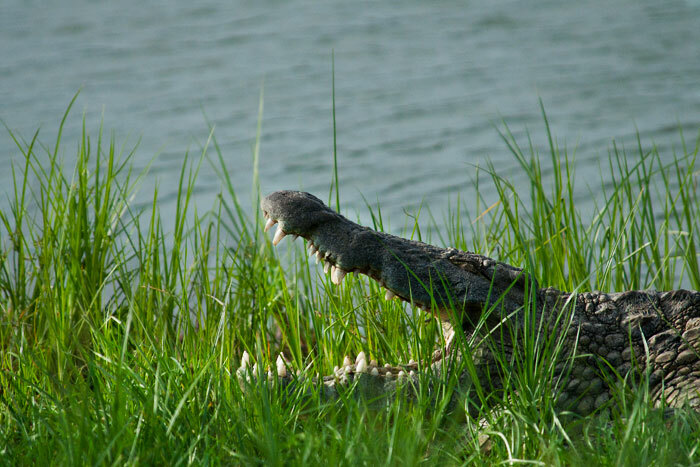 A crocodile lies outside Ronnie's Dam, showing its deadly teeth. They open their mouths to aid in thermoregulation, as they release heat through the mouth. 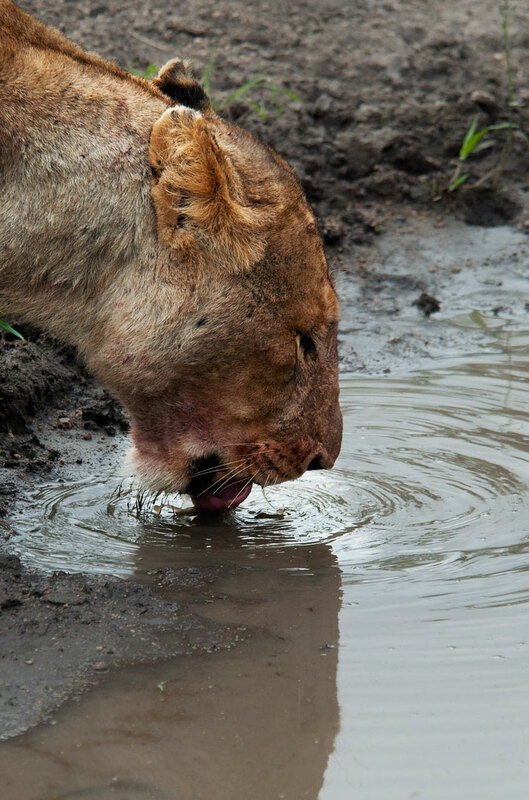 The older Tailless Female of the Tsalala Pride takes a drink at Xidulu Pan. We had spent the previous evening following the pride in the hopes they would hunt and make a kill, as they were looking very hungry. They did not kill while we were with them, so when we found this female with a bulging belly the next morning at the pan, we were hopeful they had had some success! 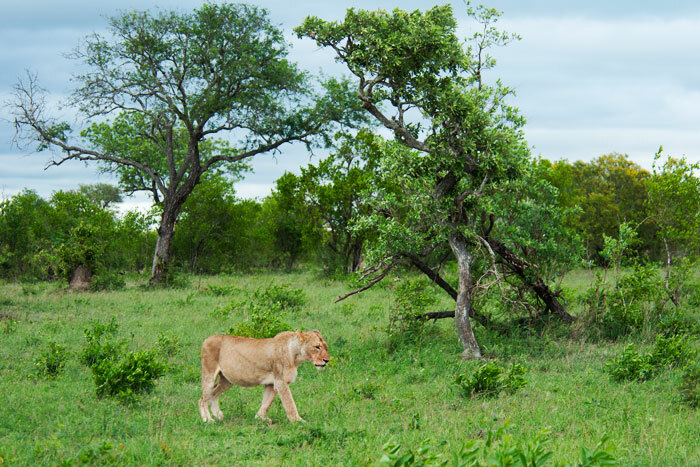 The Tailless Female walks across the clearing, eventually leading us to the rest of the pride. The storm clouds in the sky remained from the previous evening, which most likely helped them hunt successfully. The less light from stars or the moon, the more of an upper hand they have over their prey who mostly have diurnal vision. 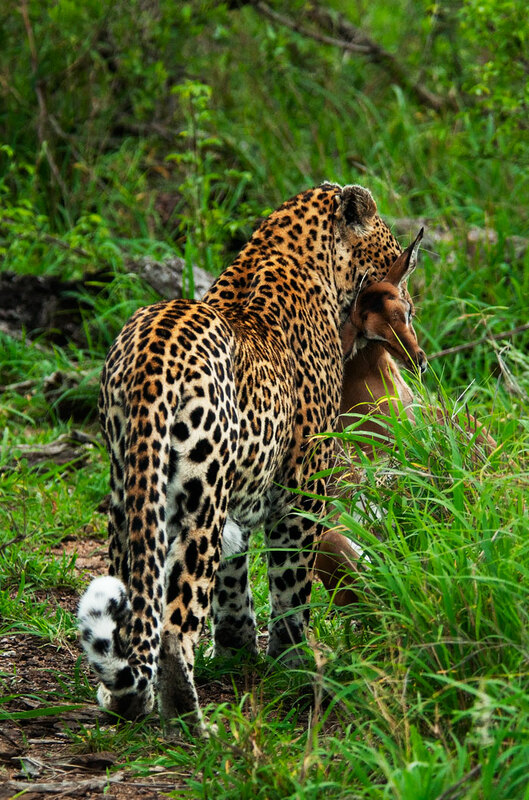 The hungry cub gets a meal! 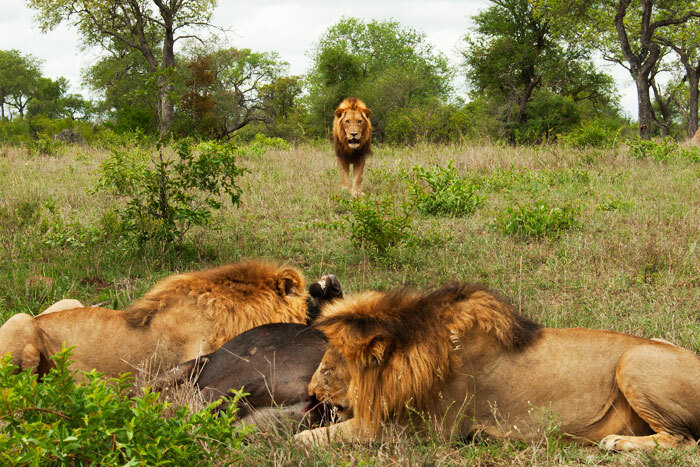 When the Tailless Female led us to the rest of the pride, most were belly-up, full from their wildebeest kill. The cub that had been missing for all those weeks, however, was still trying to feed, despite being very full. 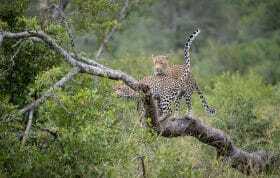 In her full state, the 'new' tailless female was lying belly-up with her injured foot in the air. This is the first proper glimpse we've had of her mangled foot, and it is amazing that she is able to walk on it without a limp! We were fortunate this week to be joined by some guests who have a huge appreciation for birds. We therefore spent a lot of time around the river and other water sources waiting to see what would come out for us. 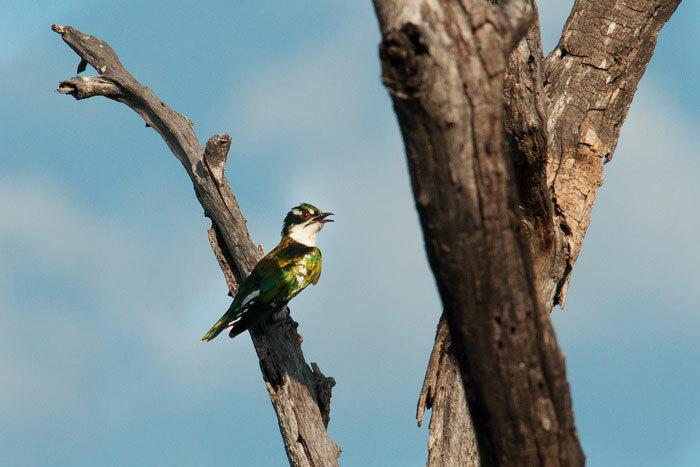 After a bit of patience, we were able to get a great view of this Diederik's cuckoo. They parasitize some of the weaver species, which is why we hear them quite often around the water at this time of year. 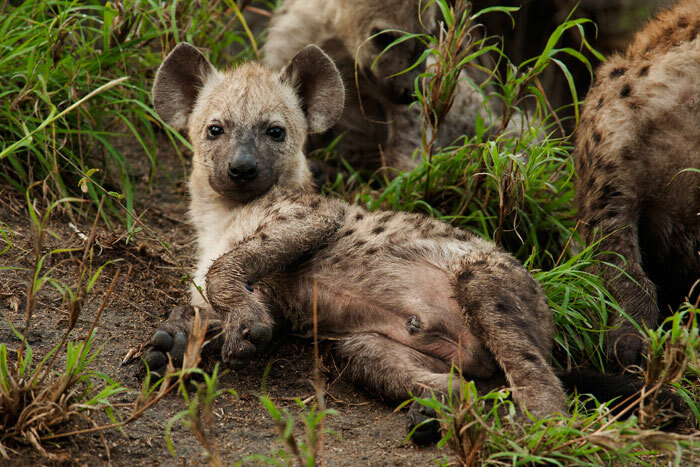 Update on the hyena den site: when we visited them this week, we thought they were sleeping deep in the burrow, and almost left without seeing them. 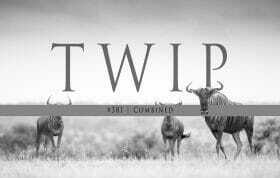 They soon appeared from a nearby thicket, having been exploring the surrounding area. They are getting brave now, and leaving the safety of the burrow without the mothers nearby! 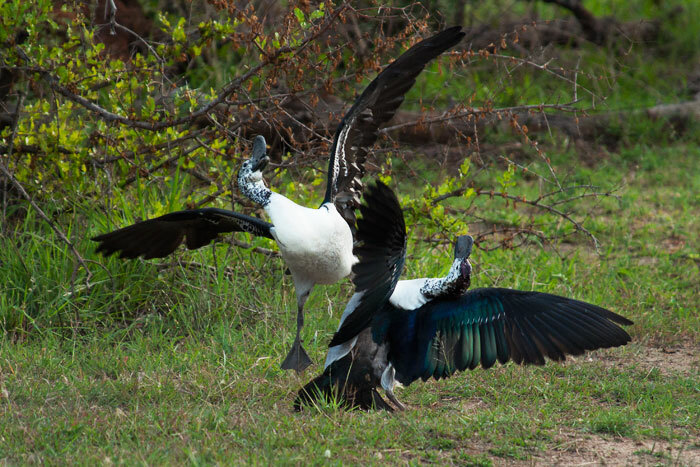 Another interesting sighting was of these two Knob-billed ducks fighting. They started by circling one another with their heads down, sizing one another up. The two males were competing for a female who watched nearby. They then engaged in all-out battle, flapping and kicking one another until the victor chased the apparent loser away from the pond. 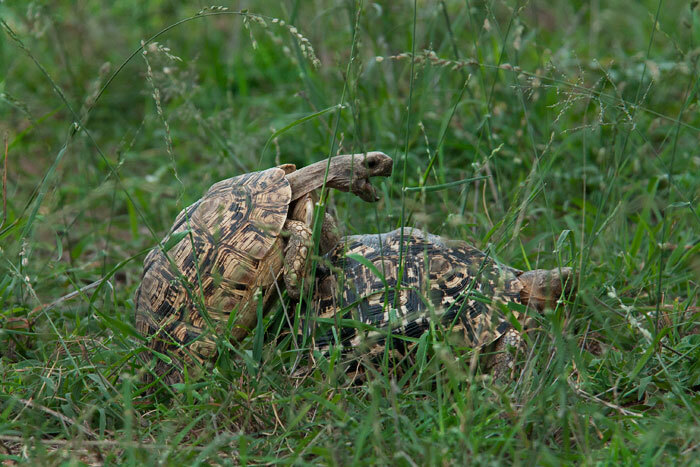 On our way to view the Tsalala lions, we had a sighting that proved to be of more entertainment to the guests than the sleeping lions provided... a pair of leopard tortoises mating! The male is usually smaller, and more determined, than the female, which made for an amusing scene of romance. 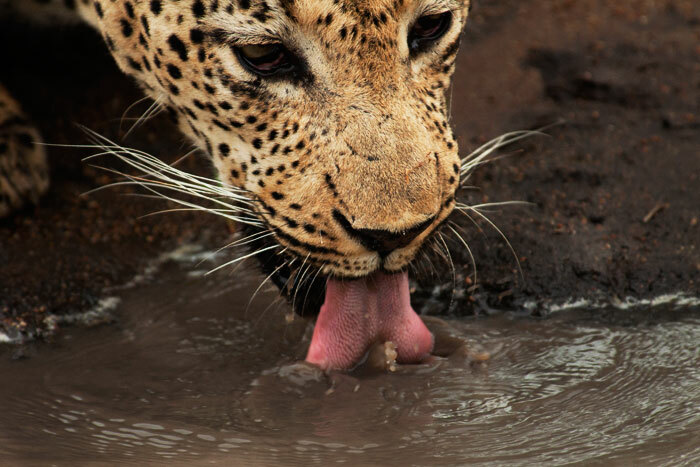 The Camp Pan Male has a drink from a puddle after a night of heavy rains. We followed him all morning, mainly marking territory and half-heartedly attempting to hunt impala. He was chased by two hyenas at one point, as well as an elephant bull who wasn't too happy to see him. Always seeming to be a willing subject for the camera, the Camp Pan Male's intense stare is a classic! 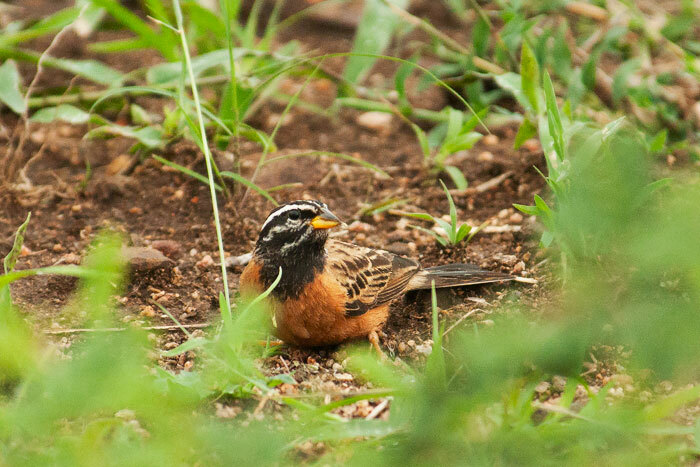 A Cinnamon-breasted bunting looks for seeds on the ground. 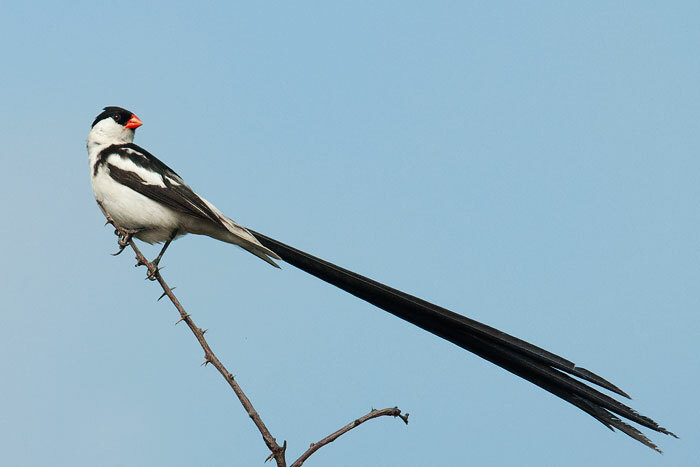 A Pin-tailed wydah looks for its mate nearby. 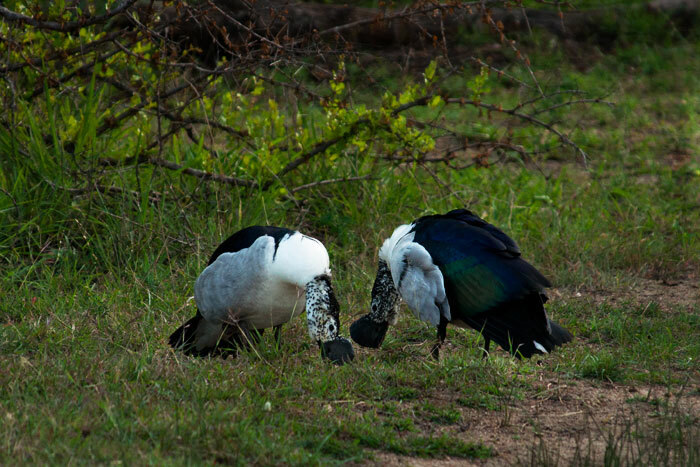 These stunning birds in their breeding plumage are beautiful, but carrying that heavy tail around can be tiring! One of the Majingalane Males listens intently to the distress call of a wildebeest nearby. Three of the four brothers were together, sleeping on a hot morning, when the cries broke the silence. It turns out the sounds came from an extremely sad situation. A wildebeest had been trying to give birth all morning, a process that usually lasts minutes in wildebeest, but clearly the calf was stuck and both would eventually die. Here, one of the Majingalane Males, the one with the scar on his nose, runs towards the incapacitated wildebeest. 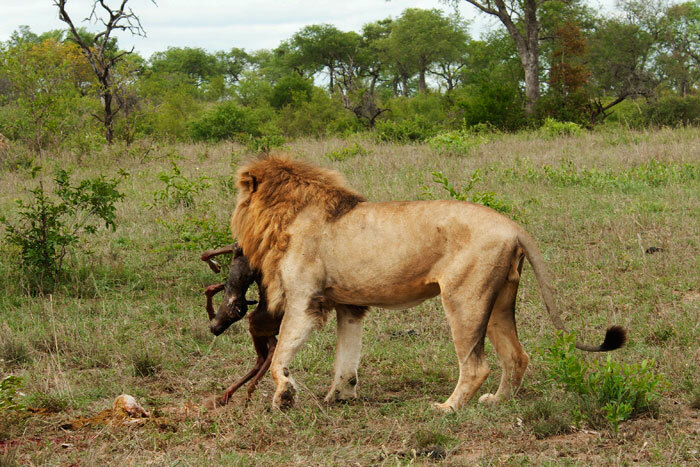 Luckily for the wildebeest, the lion strangled her immediately, putting her out of her misery quickly. Seeing the wildebeest struggling was probably the hardest thing I've ever watched in the bush, a harsh reality of nature. 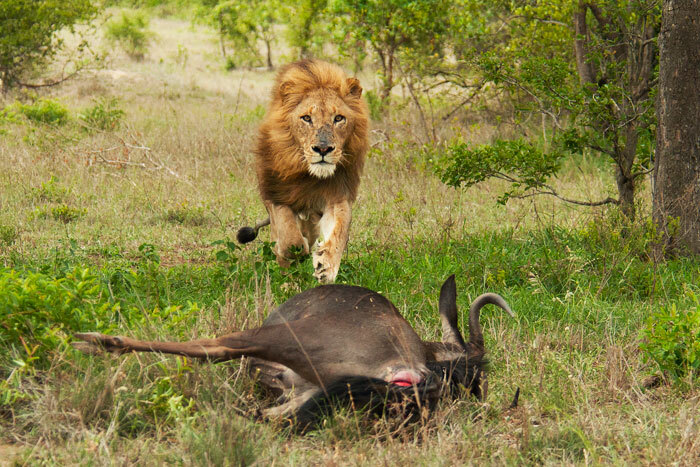 Watching the lion kill her was more of a relief than gruesome. 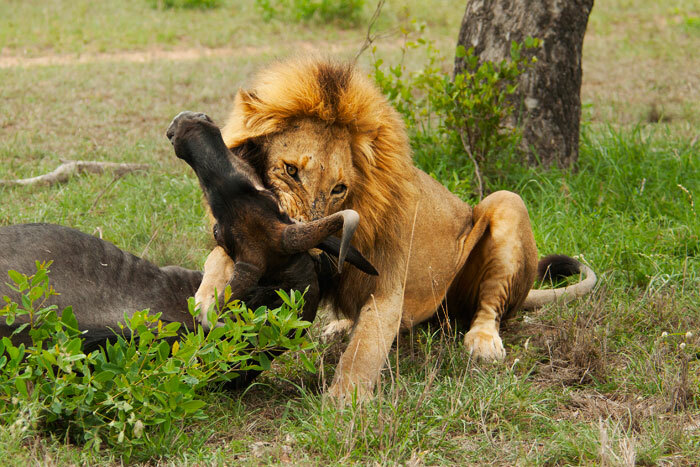 Once the prey was dead, the second Majingalane came to feed on the wildebeest with his brother. Then the third Majingalane Male approached cautiously. This was interesting to watch because with a quiet growl from the two feeding, the third seemed to know his place and stayed away from the kill. Physically he is the same size as them, but clearly they have a pre-established dominance amongst them which is most likely challenged often in situations like this, or in mating with females. The third male relaxed in the shade as the first two fed on the carcass. We were slightly surprised to see they left the fetus for last. 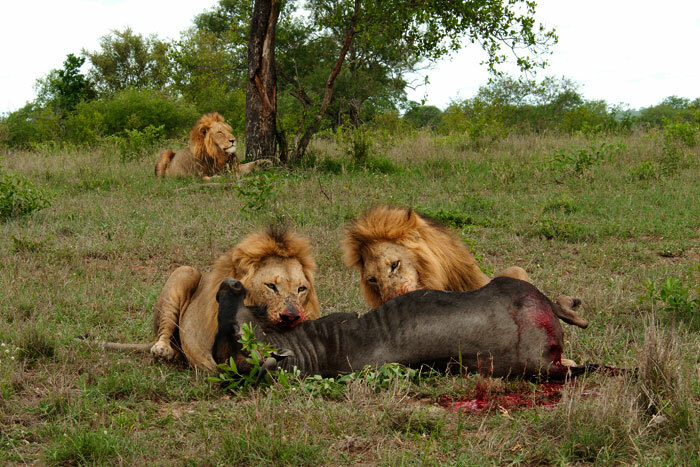 They seemed much happier to feed on the female wildebeest, and cast the fetus aside. Finally one of the males carried it away and fed on it in the shade. Wow! as always brilliant and am speechless. Thanks so much Archna! I was also speechless with the amount of action this week! Another stunning week of photos Talley! My new word for the day is “thermoregulation” which I think should also be applied to politicians! 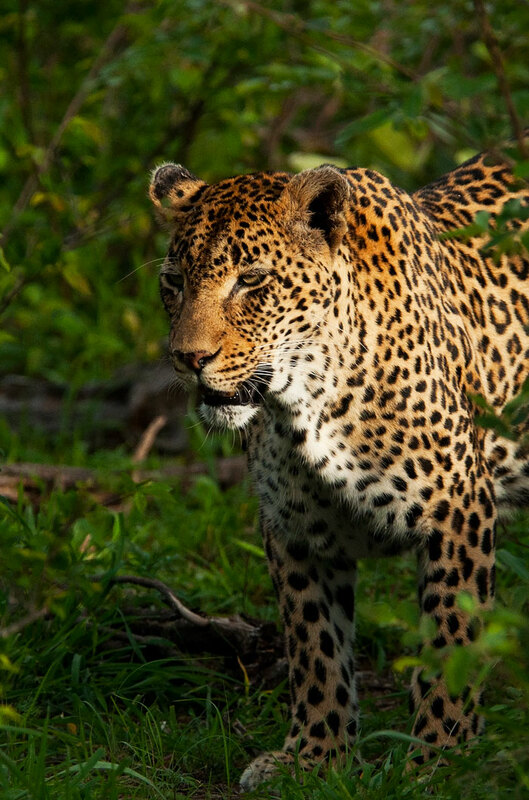 Great photos…they bring back many wonderful memories of our time in Londolozi. Thanks Joe and Kathy, hope you can come back soon. What fantastic photos and blog. Thank you so much. Great blog & photos. Tailless 2’s (TT2) foot sure looks a mess. Poor girl. You’re right Syl, it’s incredible to me how tough the Tsalala girls are. As an artist for a living, I may never have the money to travel to see this kind of thing in the wild myself. I’m very grateful to have a chance to see this close up view of these wonderful animals in their natural habitat. They don’t look the same when in captivity. I will study many of these photographs while I carve and teach others to carve.This kind of reference material is so necessary to my work. Thank you. 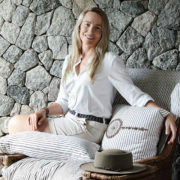 Diane, as someone who has also chosen to do what they love in life as opposed to what makes the most money, I can respectfully relate, but I would encourage you to – if you get the chance – explore different options of coming to see Africa as there are lots of ways for a range of budgets! Wonderful photos. We miss it already. We miss you guys already! Freddy and I are picking out new birding spots for when you come back! WOW. I didn’t know the Majingis manes have darken that much. They all looked like dominant males now. Francis, they are very impressive lions, that’s for sure! The best yet! What variety you see there! The Diederik’s cuckoo is splendid. 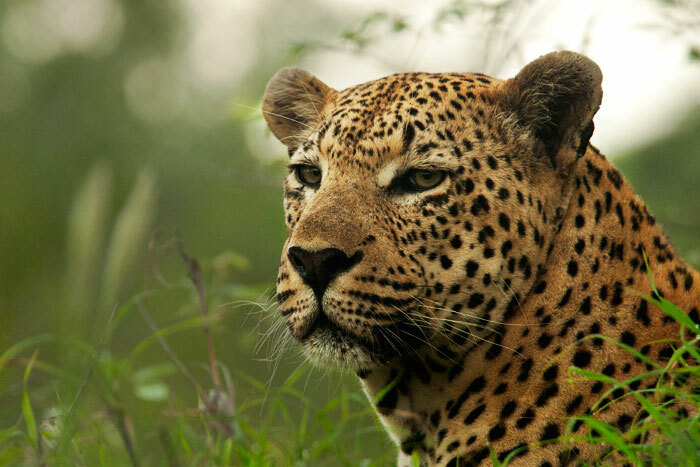 I wonder about the leopard’s spots. I don’t see them as very good camouflage, but perhaps it is….what is the story? Thanks for the great pictures! I am sure it is hard work to get them. The circle of life, in one post. Thanks Debra! 🙂 Levi came to visit the other day! Wow….some terrific camera work. 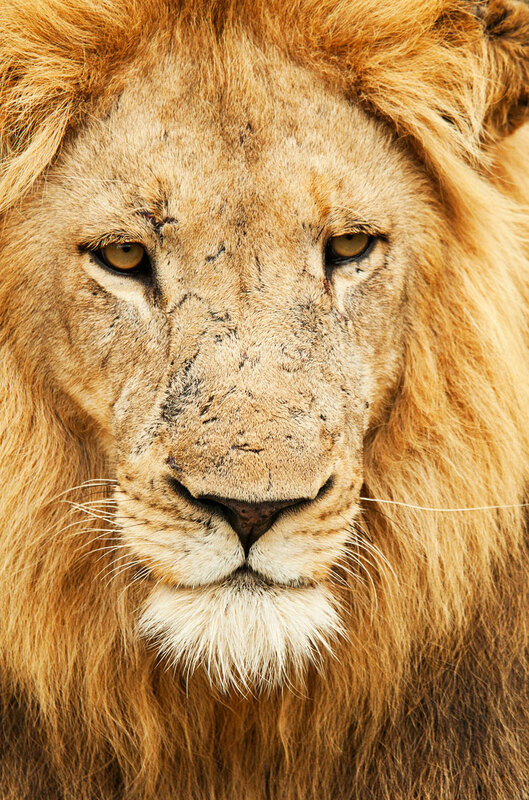 The scars on the predators show just how tough a life they really lead. thankyou. Thanks Norman, we are reminded every day how tough life can be even for the ‘king of the jungle’. What a week! 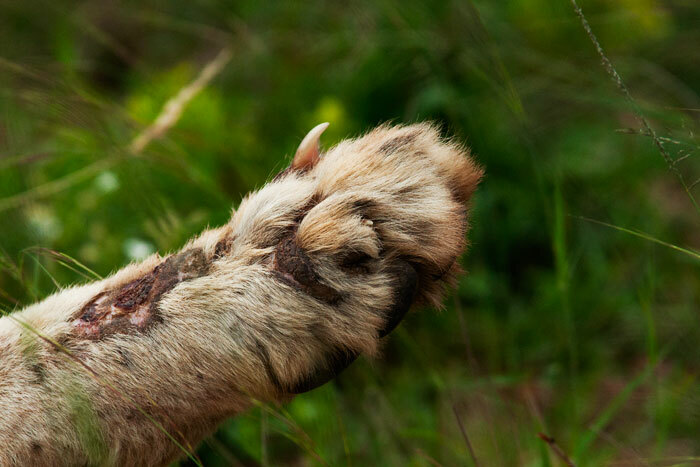 A wildebeest birthing ON FOOT! must have been a once in a lifetime moment for those lucky guests. The birding photo’s are especially beautiful this week. The bunting is gorgeous, the dederick striking as always (with such a great call) and those knob-billed ducks fighting – wow, what a treat.